St Jude is often the last resort for the miserable and suffering -- the big guns of saints. 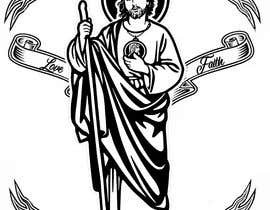 i'd like a st jude tattoo design consistent with his kind accepting image, where his arms are literally his big guns called e.g. "Faith: challenge yourself" and "None are abandonded. You are loved always." Sir, any thing you need or anything you wanna tell me, write to me in the entry, and please #guaranteed the competition, I'd appreciate it. And a normal looking guy (not too mysty eyed) -- like one of us, just a guy on the bus. hi, sir, please if you just write in my entry, to have a more personal communication. And a something like a freehand line drawing is preferred. The text at top can say "St. Jude Thaddeus". A text someplace else can say "Courage. Hope. Love." I am confused as well. Do you want St. Jude to be holding guns? Or the words you included. can you explain more im a bit confused?